Tent of Nations Told to Stop Working its Own Land – Be Ready to Act! Today, the 14th of February at 1.30 PM and as we were working on our land, specifically in the tree of life orchard, we found on three different places , papers with maps signed by the civil administration of Judea and Samaria which is the Israeli military government. The papers say that we have to stop working on the land specified on the map, because they declared it as a state land. According to them, this land doesn’t belong to us but it is a state land and we are cultivating it. The papers also say that if we want to challenge this order, we can appeal against it within 45 days in front of the military representative office. It is a shock to receive something like that after 21 years of legal battle defending our land and the right to it in front of Israeli courts. We sent those papers to our attorney in Jerusalem and he is going to appeal against it within the next days. 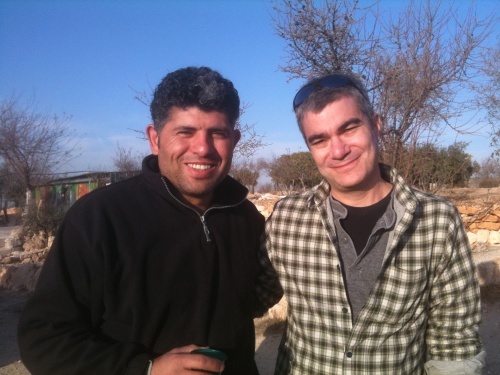 Readers of my blog should be well acquainted with my friend and personal hero Daoud Nasser. Last year I wrote about Tent of Nations and my visit, together with twenty JRC congregants, with Daoud on his family farm. This new development is just the latest in a long history of harassment courtesy of the military administration in the West Bank – an institution that provides the shameful “legal” cover for Israel’s outright theft of Palestinian lands. Please stand by – I will forward any further news from Daoud and let you know how you can act on his behalf. This entry was posted in Civil Rights, Human Rights, Israel, JRC I/P Study Tour 2010, Nonviolence, Palestine on February 21, 2012 by Rabbi Brant Rosen. terrible sad.people who fought and won the right to develop a piece of land that they can call their own has been a dream of people in many countries.to take this away is horrific and displace the people who have been living there.Please keep me informed and let them know that many care. It is so important that we support Daoud and his family. We with more access and privilege than others must act on their behalf. Having met with Daoud on the JRC trip and having been a witness to these atrocities makes this even more urgent. I, too, have been to the land of Daoud and his family. It is important to make people aware of these actions and protest such land confiscation. I have been in contact with Bshara and will be going to Tent of Nations soon, I will let you know first hand as soon as anything new develops. Thanks for the post. Having planted a tree in the Tree of Life orchard last year and hosted Daoud in my home a few times, I too care very much about what happens to him and his family. All of us must protest these injustices and do what we can to help. I visited the TofN last summer and was moved by their story but the peace there was over whelming. My thoughts and prayers are with them all. They can’t be allowed to do this outright theft of land. Somehow make this foul play case known to the world because it showcases Israel’s ethnic cleansing in action. How I wish I could be there to protest this injustice in person. So here we are, listening to scary stories about Iran and watching as ALL the presidential candidates fall over themselves promising their unflagging support of Israel. Meanwhile private land is being confiscated or threatened, houses are being demolished, Palestinians are being forced into Bantustans, and no one notices. I wonder how many Americans on the Christian Right, who have so unwaveringly given their support to the Israeli occupation of Palestine, realize that Daoud is a Palestinian Christian and that they are supporting a regime that is taking his land away–land that his family has owned since Ottoman times.